Figure 1: The Chanel Travelling Pavilion. Figure 2: Trial assembly of some of the complex panels for the Chanel Pavilion. Figure 3: Chanel Pavilion site assembly in Hong Kong. 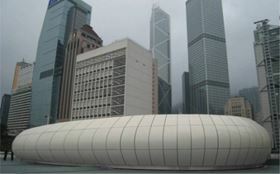 Figure 4: The completed building in Hong Kong. Figure 5: Chanel Pavilion entrance. Figure 6: Inside the structure. Figure 7: Energy consumption in the manufacture of materials. Figure 8: The Fiberline FRP footbridge. Figure 9: Bridge deck replacement with FRP. 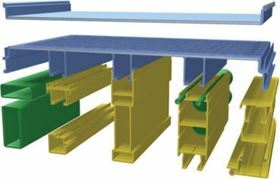 Figure 10: Complete prefabrication of bridge structures. Figure 11: The Standen Hey bridge. 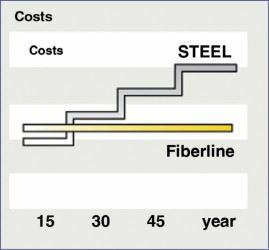 Figure 12: Relative costs of steel and FRP bridges through life. Table 1: Assessments of candidate materials for bridge construction. Figure 13: Startlink pultruded profiles. Table 2: A Startlink house would reduce the on-site work required. Figure 14: Mount Pleasant Bridge. Figure 15: FRP bridge deck costs and savings for a single-lane bridge. Figure 16: FRP bridge deck costs and savings for a two-lane bridge. 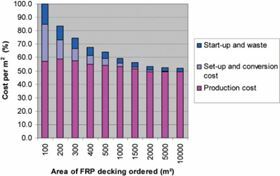 Figure 17: FRP bridge deck cost reduction with quantity. The conference was titled The Business Case for Composites in Construction. It aimed to increase awareness of the commercial benefits of using composites in construction and therefore assist in the future growth of this important market sector. The NGCC had identified that commercial pressures were both one of the main reasons for selecting composites in construction applications and also a potential barrier to their use, especially where the business case for composites was not adequately understood. The conference (which was free to NGCC members), was well attended with over 40 delegates. The conference was chaired by Dr Sue Halliwell from NetComposites, who is also the Coordinator of the NGCC. She explained that the NGCC is a membership-based organisation promoting the use of fibre reinforced plastics (FRP) in construction. It holds several events each year, produces technical information, and has an extensive website containing a wealth of information on the use of composites in construction, together with links and contacts on how to obtain further details. Some information is in the public domain and some is within a restricted members area, which also contains the full presentations from this conference. A keynote address was given by Professor Steve Denton from Parsons Brinckerhoff, a planning, engineering and construction management company. This highlighted several important issues that could easily be overlooked in assessing the business case for composites in construction, but which will be of increasing importance in the future. These include issues such as social and environmental impact, in addition to the more obvious ones of financial viability. Denton explained how the use of FRP composites for structures such as bridges can bring social benefits, for example by reducing delay and disruption to the road and rail networks because of quicker and easier installation. He also demonstrated how the use of FRP in major construction infrastructure is maturing and moving beyond pilot projects into higher volume commercial applications, selected for purely commercial reasons. 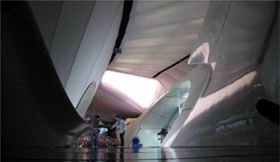 In a joint presentation, Edwin Stokes from Arup and David Kendall of Optima Projects discussed the development of the FRP façade cladding system for a futuristic building forming a mobile arts pavilion as shown in Figure 1. Stokes explained that the building was created to house a travelling art exhibition sponsored by Chanel, which would tour 13 international cities. 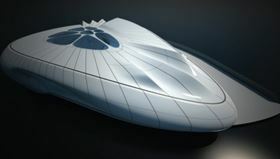 The futuristic form of the building was designed by Zaha Hadid Architects, with overall engineering by Arup and FRP engineering by Optima Projects. Stokes introduced the concept of 'digital architecture,' where the architect's computer models are used for direct manufacturing of components or tooling. 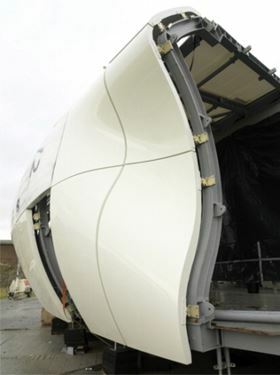 Because of the very complex nature of the cladding this concept was embraced from the start of the project, with minimal conventional manufacturing drawings being produced. The fact that the building would be deployed in so many different countries, as diverse as Japan, the USA and the UK, meant that it would have to comply with numerous different regulations and standards, particularly regarding issues such as fire. For transportation the whole building is to be dismantled and shipped in standard 12 m International Organisation for Standardisation (ISO) containers. 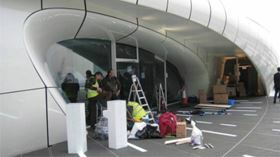 The manufacture was put out to tender and won by ESS, with Stage One Creative Services as the FRP façade sub-contractor. The complexity of some of the panel shapes can be seen in Figure 2. Cost was not initially considered as a major problem, but as the building was so complex it soon became apparent that the allowable budget would be tight and innovative forms of construction were required to deliver the façade within budget. From the performance requirements listed above the greatest compromise to achieve an acceptable cost was allowing a heavier solution than would have been possible if more expensive materials had been selected. all to fit within ISO containers. Following the digital architecture philosophy, the architect's computer models were translated directly into finite element analysis (FEA) models to enable the structural engineering of the façade to be carried out efficiently. Due to time constraints conventional materials were selected that were considered to be low risk, including Scott Bader 356PA laminating resin and 48PA gel-coat, both of which were fire retardant and should have provided a 'Class O' system. To everyone's surprise, when tested the laminates only achieved Class 2 spread of flame, requiring the addition of an intumescent flowcoat to achieve the required Class 1 on the inside. The manufacturing process developed by Stage One involved the direct machining of individual moulds for each panel into polyurethane (PU) foam blocks using a 5-axis CNC machining centre. The panels were than moulded using conventional contact moulding methods and post-cured. This resulted in a geometrically accurate surface but required some considerable hand finishing prior to painting to achieve the required finish. The panels were partly trial assembled in the UK, prior to being shipped to Hong Kong for the first leg of the world tour, as shown in Figure 3, Figure 4, Figure 5 and Figure 6. Stokes and Kendall concluded by stating that the project had been a great success, but next time they would hope to create an all-FRP structure without the steel frame. This may well be a more economic solution and would certainly be easier to transport and erect. Christian Scholze from Fiberline Composites gave an introduction to the pultrusion process and the pultruded profiles provided by Fiberline. 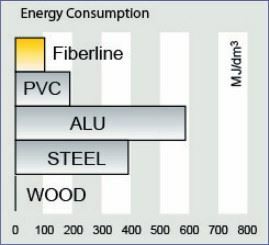 He presented an interesting graph (Figure 7) showing the energy consumed in producing various materials, demonstrating the potential environmental benefit of FRP compared to other construction materials. Fiberline recommends painting pultrusions used in external applications to provide additional environmental protection and a 30-year life to repainting is normally achieved. 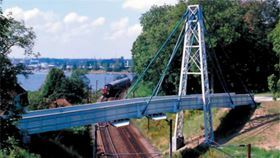 Scholze showed various footbridges made entirely from FRP components, such as the 'Fiberline Bridge' in Denmark (shown in Figure 8), which was erected in 1997, taking only 18 hours to install on site. He also demonstrated how pultruded FRP decks are being used very successfully in combination with steel structures both for new bridges and to refurbish existing bridges by replacing corroded steel or rotten timber decks, as shown in Figure 9. The use of FRP enables rapid deck replacement, a reduction in dead load and reduced future maintenance. Scholze continued to explain the benefits of prefabrication that could be achieved with FRP including, in some cases, building a complete bridge in the factory before being transported to site for quick and easy installation. The use of FRP, either for the complete structure or in combination with steel, reduces the dead weight and enables larger sections to be prefabricated, as shown in Figure 10. 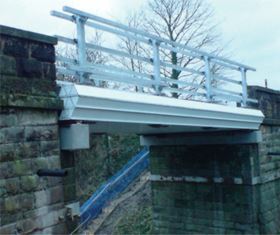 One of the company's more recent projects is the Standen Hey bridge in Lancashire, England (Figure 11). This vehicle bridge is 9 m long and weighed less than 10 tonnes. 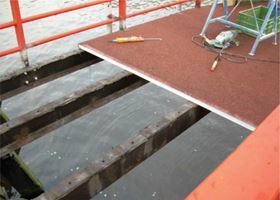 Scholze concluded that while initial costs for a FRP bridge may be slightly higher than a steel equivalent, once the benefits of easier installation and reduced maintenance are taken into account, the total cost will be considerably lower for the FRP option. This is shown graphically in Figure 12, although this does not appear to account for the possible repainting of a pultruded structure after 30 years. However, even if this is included the FRP option will still be more economic after the first repaint of a steel structure at around 15 years. Dr Sue Halliwell from NetComposites presented the environmental case for FRPs in construction, which is becoming increasingly important in the materials selection process. She explained how both legislation and asset owners are demanding improved environmental performance and longer service life with reduced maintenance. In the UK building sector change is driven by the Building Regulations, most notably Part F – Ventilation, and Part L – Conservation of Fuel & Power. There is a target to reduce UK carbon dioxide (CO2) emissions by 60% from 1990 levels by 2050. As 46% of carbon emissions are from buildings in use, the construction industry will clearly have a major role to play in meeting this target. composite materials can be tailored to contain reflective coatings on strategic surfaces to reduce solar gain. Halliwell showed how environmental credentials may be assessed using techniques such as life cycle assessment and the Green Guide to Composites, which has an online tool. The Green Guide rates materials and processes from A (good) through to E (poor), and 12 different environmental impacts are individually scored and totalled to give an overall rating. The Green Guide is currently being expanded and further developed in a project led by NetComposites. Halliwell then presented a case study based on a previous paper by Ryszard Daniel and Gerland Nagtegaal of the Netherlands. This assessed the environmental impacts and costs for potential materials for the 13.5 m long Noordland Footbridge. The results of this study are shown in Table 1.
in assessing pollution impacts FRP was again a clear winner. 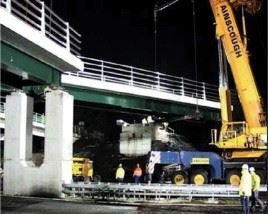 The final material choice was based on ecological factors and the FRP bridge was installed in October 2001. Finally, Halliwell addressed the critical issue of end of life options. She reported that, despite the development of recycling methods, the most common method of disposal of FRP is still landfill. It is expected that future waste management legislation and the increased cost of landfill will increase the uptake of recycling and reuse and put more emphasis on minimising waste. Halliwell explained that, at present, there is not a clear market for FRP composite recyclate and research is needed to develop markets and products for recycled FRP. Pilot projects have demonstrated that it is feasible to recycle FRP, for example by grinding to produce a filler for new materials, but a reliable supply chain must be established. It is also viable to incinerate FRP materials and recover energy due to their high calorific content. can be delivered to site flat-packed and finished, avoiding all site waste. each Startlink house would save 16 tonnes of carbon compared to a traditional house. Singleton explained that a Startlink house could also be more affordable than a traditional house and would dramatically reduce the site work required, as shown in Table 2. Jon Shave of Parsons Brinckerhoff presented the business case for using FRP bridge decks. He explained that the UK's infrastructure is mainly mature in its development and that the current focus is on improvement and enhancement. This brings special challenges as much of the work is undertaken on, or adjacent to, existing roads and railways that are already in use. Disruption for users is therefore a key consideration in selecting new methods of construction. The drivers for the use of FRP are therefore quicker installation times and lower maintenance, leading to reduced installation costs, reduced delays and lower whole life costs. He explained that for bridges over main roads such as motorways or over railways, the disruption and delay costs can be a significant part of the total cost. To explore the business case in more detail, Shave used the Mount Pleasant Bridge as an example. This has two spans of 26 m, with an FRP deck on steel beams, supporting a single vehicle lane, as shown in Figure 14. This showed that the structure cost for the FRP deck was more than a conventional concrete deck. However, the additional structure cost is offset by significant savings in the scheme cost and whole life cost. In fact the installation, traffic management and user delay costs during installation alone would balance the additional structure cost and this was therefore considered an economic success, which would provide cost savings through the life of the structure. Shave then questioned whether this type of construction would be viable for longer spans and wider bridges and presented his research to answer this. This showed that for a 6 m wide (single lane) bridge the extra structure cost is balanced by installation savings, as shown in Figure 15. Unfortunately, this is not the case for a wider bridge, as seen in Figure 16. In this case, the installation savings do not increase as much as the increase in structure cost. To make the FRP deck viable for such a bridge, it would be necessary to reduce the FRP deck cost by around 30% for the extra structure cost to be balanced by installation savings. However, this analysis was based on costs for a one-off bridge and if greater quantities are produced the production process can become more efficient. As Figure 17 shows, the structure cost for five bridges would fall by around 30%, making the FRP deck a viable option based on initial costs alone, and therefore providing significant savings over the life of the structure. Dr Chris Burgoyne from the University of Cambridge gave the final presentation of the day and explained that he started investigating the use of FRP to reinforce and pre-stress concrete structures 26 years ago and now questioned why this application had not really expanded. He showed that in real terms the costs of reinforcing fibres such as glass, carbon and aramid have actually increased rather than reduced, despite significant growth in the production of such materials, mainly for the aerospace market. Burgoyne said that despite a lot a talk of whole life costing, most clients will still select the cheapest initial cost solution and that whole life costing calculations are often unrealistic. However, he noted that use of FRP in other niche areas such as repair and strengthening is economic and it is often the preferred material, based solely on initial costs. The audience was also of the opinion that there is significant potential to increase the use of composites in construction but that applications must be efficiently designed and engineered to be cost-effective. Clearly FRPs will not replace conventional construction materials in all areas, but will find increasing applications in what is potentially a huge market sector.